In certain reenactment circles, mainly those concerned with reproducing artefacts from long ago using as true to era methods and materials as possible, the subject of dyeing bone comes up. Bone was used for a wide variety of tools; lucet, knife handles (middle), needles, smoothing tools etc, a whole plethora. There are extant recipes for dyeing bone in a variety of ways, the palette may seem a little limited to us today, given the sheer range of chemicals that represent almost any colour that we could wish for. Coloured bone could be used for artefacts such as jewellery, inlay work and things such as knife handles. Brazil wood, Caesalpina Sappanensis and C. Echinata, the former is the brasil wood of medieval times, the latter is the New World alternative that was discovered by early Portuguese and Spanish colonists. C. Sappanensis occurs naturally in places such as Southern India and Sri Lanka and had a long history of being exported to Europe as a very bright red dye stuff. The discovery of the C. Echinata meant an alternative source and a reduced monopoly on trade from the East. Madder, Rubia Tinctora, the root is used, either pulverised or in small pieces, this was a common dyeing plant used across Europe for many hundreds of years. It yields colours ranging from orange tawnies to reds and browns, depending on the location of dying and mordants. There is evidence that madder was also used as a paint for woodblock prints, but its primary use was to dye cloth. In both red dyes the mordant is alum, this enhances the colouring and binds the colour to the substrate, I used commonly available dyeing recipes, ie an amount of either brazil or madder and an amount of alum, in this case a handful of madder with two tablespoons of alum, brazil a small handful and the same amount of alum, this was rule of thumb given the quantities of bone I was dyeing. For dyeing bone, one recipe uses what is in effect black ink, made from a source of tannin and iron salts, often oak galls and ferrous sulphate, respectively. For my black bone I simply let the bone soak in an ink batch I had lying around. One recipe mentions the use of verdigris, or copper acetate for the colouring agent, this chemical is made by exposing copper to acid fumes, the green is then gathered from the surface and is used variously as a pigment, ink and a dye for bone and wood. The bone or wood is laid into a solution of verdigris, then over time this takes on the green colour. At the time of writing this I have a piece of bone lying in a solution, when it it is ready I shall update this entry. 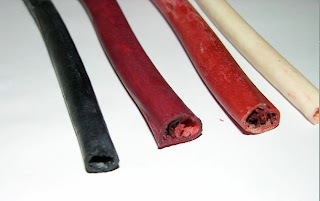 The image shows four goose bones, from left to right; black (oak gall/iron), red (brazilwood), red(madder) and undyed for control. You will note the difference in colour of the two reds, the brazil is a cooler red with a blue register and the madder is a warmer red erring to the orange, also of interest the madder specimen was a deep orange rather than a red when first removed from the solution, but overnight turned more red, I regret not taking a photo of this, next time perhaps. Close up of end of goose bone in brazil. Close up of goose bone in madder. Close up of goose bone in iron gall solution (ink). ooh very nice! Did you just leave the bone in the madder / brazilwood, or did you heat those solutions as you would when fibre dyeing? Oh, and your links are the same colour as your background on the page! Hi Gina, for the reds I started them in a hot dye bath, but left them in for 24 hours, so most of the time it was cold. On my set up the links are in white, I shall sort that out, thanks.